Today, it was announced that Joey Gallo would make his big league debut with the Texas Rangers Tuesday night in a game against the Chicago White Sox. Now a consensus top-ten, major league prospect, the Las Vegas native was as struggling A-ball minor leaguer. On June 5, 2013, Gallo had a slash line of .211/.316/ .485 with 90 strikeouts in 56 games. His season turned over the next five games when he went 11-for-18, which included a three-homer game at Hagerstown. 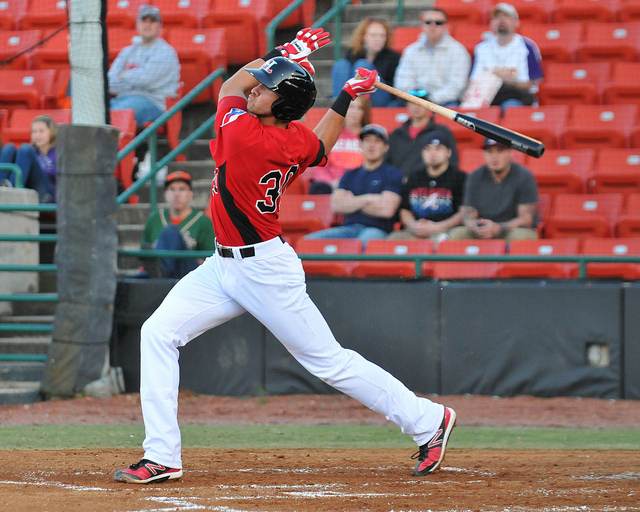 Gallo went on to finish with a Crawdads single-season club records of 38 homers and a .610 slugging pct. I interviewed Gallo about a week after his June hot streak in preparation for a feature article I wrote about him. He talked about the struggles of the first two months of the season, as well as the development of his powerful swing. Following the interview are some quotes by several of the Crawdads and Rangers player development staff. Gallo: I’ve been playing baseball ever since I literally can remember. My parents said I just kind of picked up a bat and just started swinging and ever since then, the rest is history. I just started playing. I didn’t ever play any other sports, but just stuck to baseball and had that one goal in mind to play pro baseball and hopefully make it to the major leagues. I’ve been playing baseball since I was three years old. Gallo: It was always major league baseball. There was not one second of my childhood that I didn’t think “maybe I don’t want to play major league baseball.” It’s always been my goal throughout my whole childhood. What positions did you play in high school? Gallo: I played short and then my senior year I played third for the draft. How did it come about that you would be a position player rather than pitch? Gallo: Some teams wanted me as a pitcher. Actually half of them wanted me as a pitcher and I just didn’t want to. I always wanted to hit and play every day and be on the field every day. I love to be out there and helping the team win, not every five days, but every single day. I just always loved hitting. Obviously, hitting home runs is fun and I didn’t want to give that up. In the long run, if things turn and maybe I can’t be a major league baseball player as a hitter, I can always switch to pitching. What are some of the highlights you had at Bishop Gorman? Gallo: We won seven (state championships) in a row, including the four years I was there. Obviously, every time you win a state championship it’s a huge highlight and it’s great. My freshman and senior year we ended up being national champions. That’s probably the two biggest highlights of my time there. Winning a state championship every year is not easy. Every time you dogpile on the field at the end of the year is a great feeling. How did you go about developing your swing? Gallo: Ever since I could swing and understand how to be taught how to hit, my hitting coach has been a guy by the name of Mike Bryant. He son was just drafted second overall – Kris Bryant – in this last draft. Me and him used to hit together all the time, so he was my hitting coach since I was five years old all the way up until I graduated from high school. Mike’s the person that has had the biggest influence on my swing today. He really helped me put that swing together. How did the power develop? Gallo: He helped me out a lot with that. His son, too, has tremendous power. He led college baseball in home runs this year. It’s been kind of weird because we’ve both been compared to each other. He’s a righty and I’m a lefty, but even though we’re on different sides of the plate we have the same package of power. It’s hard to tell people how you hit for power. I’ve just always been able to hit for home runs, ever since I was eight years old and I hit my first one. Ever since then, I could always hit home runs. Maybe it’s my leverage or hand strength or arms. I’m not really sure; I just know I can drive the ball. In watching you take batting practice, even in games, it’s not like you have a violent swing. It seems so easy and flowing. Gallo: Obviously, being a big guy helps you out, too. You really don’t have to swing as hard as you can to hit the ball out. I don’t really ever swing as hard as I can. I just usually try to get the barrel to the ball. If I’m fortunate enough to get it over the fence, then it goes over the fence. I don’t really like to tense up and swing hard. That’s going to prevent you from hitting the ball farther. I just use the hands to get the barrel to the ball. You had signed a commitment to go to LSU, but I’m guessing with your potential draft position that was never really a possibility of going there, was it? Gallo: There was actually a very, very strong possibility that I was going to go to LSU. Absolutely, I was committed to going there and getting a college education. That was actually really big to me. That’s something that when draft time came around that maybe some teams started to get scared off a little bit because I was very interested into going to LSU. Obviously, going to the College World Series with a great program and stuff like that. I wasn’t signed there just because I had to sign and go to a school. I really wanted to go there. What prompted you to come out? Gallo: The Texas Rangers organization had a really big influence on it. They’re developing players everywhere and they’re coming out of nowhere with all of these great players. There’s not really a better team to play for than the Texas Rangers at the major league level. So I had to sit down and say, do I want to risk it again in three years, or do I want to take the opportunity to make the best of it with an organization like the Texas Rangers. That was probably the biggest thing. What would you major have been? What are some adjustments that you’ve had to make in the past year since high school? Gallo: Obviously being away from home. That’s a huge adjustment, especially for teenaged kids. That’s probably the biggest one. It just being able to live on your own now and not having the college campus right there and taking care of ourselves now. Playing every day and getting your body ready to play all the time. That’s always the toughest thing is to be mentally prepared every day to play and to be physically prepared to play at a professional level every single day. Who’s been the biggest help for you in the past year? Gallo: My parents (Laura/ Tony) have been the biggest help to me. They are always there for me. When I hit a slump, they’re always there picking me up. They watch videos on me all the time to see if they can point out something. They’ve been with me for the last 19 years and they know me better than anyone else. 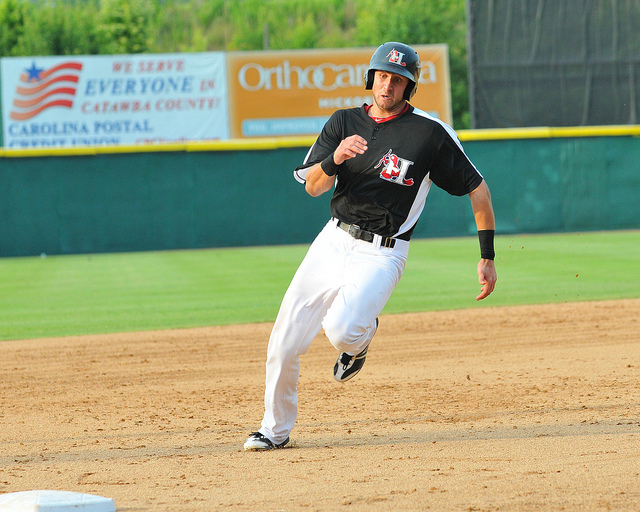 Mashore (2013 Crawdads hitting coach Justin Mashore) has been a huge help to all of us. And our teammates, without them this isn’t fun. They’ve been the biggest help in picking each other up and having fun together. Most of the time, you see us out there having fun and smiling. We get along. Let me ask you about this current group being together the past year. How much have you all leaned on each other the past year? Gallo: A lot, because we’re going through the same stuff. Most of the time, we’re going through the same struggles. It’s always better to have somebody who’s been through it with you at the same age that you get along with. That’s the biggest thing with us, we’ve known each other for the last year. We’ve been a team for almost two years now. That’s the good part about us is that we know each other’s weaknesses and strengths. We know how to help each other out, like when we see each other’s swing go wrong. A guy like Lewis Brinson can tell me, “You’re doing this wrong,” and will just automatically help me out. Other than a guy that I just started playing with this year can’t really tell me too much because he hasn’t seen me as much. Was the first six weeks more of a struggle than you expected? Gallo: It was definitely a struggle and was probably the worst baseball I’d play in my life. I don’t want to say that I didn’t expect it, but obviously making a jump to full-season ball there’s going to be a little jump where maybe the average comes down. But you’ve got to make adjustments to that. I’m starting to do that now and starting to get the hang of it and getting my swing down. I wasn’t too impressed with how I was doing, so I wasn’t too happy about what was going on. I just had to keep my head up and keep going at it and see things get turned around. When can you tell when things are going to start clicking for you? Gallo: I think the biggest thing that I can tell that things are turning around is when I start hitting balls to centerfield and line drives and hitting balls the other way and not just pulling balls. It’s almost like, sometimes when I go up there, like the last couple of days, I felt like whatever this guy throws, I’m going to hit it hard and maybe hit it out. That’s the biggest thing with me is if I go up there with confidence I feel like I can be better than anybody else up there. I think that’s the biggest thing, that if I see balls go to centerfield hard and I’m sitting back on off-speed and have an idea that I’m in a good hitting position, then I know that I’m doing things right. I talked with scouts to hear what they say about you. One scout compared you to Adam Dunn, in a power sense. What goes through your mind when you hear or read stuff like that? Gallo: First of all, it’s very humbling. That’s pretty special to be named like that in a power sense. But it doesn’t really mean much to me because you’ve still got to go out there and prove it. It’s obviously a great honor to be named and for a scout to say that, but still, you’ve still got to go out there and prove that you can do that and prove that you have power. It’s pretty cool to hear things like that and obviously it’s what you work for to be named in groups like that and for scouts to say stuff like that. That’s pretty cool. You had the big three home run night at Hagerstown the other night. How special was that for you and what do you take from that? Gallo: It’s very special. It was a pretty cool day. It was good after that, because I felt like I was confident again and I can turn my season around and maybe start helping my team win a little more and hit hitting the ball out a little more and getting a few more hits a game. What is the biggest thing for you to work on between now and the majors? Gallo: Probably just consistency. Coming out there and having my best at bats every game and not just having games where I go 0-for-4 with four Ks. Instead of being 0-for-4 with four Ks, I get a hit in between there or go 2-for-4 and coming out here consistently and having my swing every single day and not letting that go away and throwing away an at bat. Become a complete player is important for you, isn’t it? Gallo: That’s something I’ve worked on my entire life. Swinging the bat can only get you so far. Sometimes in order to help your team win every day you’ve got to be able do the little things well like field ground balls and make plays that maybe some other people couldn’t make and run the bases the right way. That makes a difference in the game. In a one-run game, it’s who can run the bases better, not always about who’s going to hit more home runs that game. So, I’ve always prided myself in being an all around good player, not a good hitter or a power hitter. I think he’s outstanding. He is the one player here that we did push last year. He had already won the home run title in the Arizona League. We felt like he had kind of conquered the competition there, so we decided to challenge him and send him up to Spokane for the last few weeks and get him exposed to a little bit higher level of pitching, a different quality of competition. To his credit, one of the things he told us this spring was he realized that we sent him up there for a reason, and that was to show him how difficult it is as you move level from level. I think it was a great experience for him, because he learned about failure. Even though he had had great success he went up there and he struggled. I think it was a great lesson for him and I think it was a great lesson for the rest of these guys. Even though you win a home run championship in one league, moving up to the next league doesn’t insure that you’ll automatically step up and be successful. You’re going to have to adjust; you’re going to have to get better as the talent gets better above you. Joey’s a great kid. He has a great family and is from a big sports-oriented school. There was a lot of good training that he got and he’s got some natural ability. He’s got the ability to hit with power. To me, you learn a lot about power, but a lot of it’s God-given to be able to hit balls like he can hit them. He’s fun to watch and he had a great spring, so we feel really good about him here. What have you seen in Gallo’s development over the past year? I think just the maturity factor on a day-to-day basis. I’m sure a lot of people will want to talk about his ability and stuff like that, but we knew he was a special player last year when we got him. But, I just think on a day-to-day basis about how he goes about his business, the routines that he’s settled into and learning how to be a professional I think more so than anything. To be as big as he is he’s a very good athlete and has very good speed. He can more around as good as any of them to be honest. He’s just learning how to get into a better position more consistently and be ready for the ball to be hit to him. It’s kind of a focus deal learning how to focus for a full game over there. Sometimes, especially as a young kid, they haven’t had a ball hit to them in a few innings and it probably gets a little monotonous over there. Learning to keep their focus and to stay into it, because sooner or later you are going to get one and you’ve got to be ready for it. As far as raw power goes, who have you seen that compares to Gallo? Nobody!. Eighteen, nineteen-years-old the last two years, not at that age, especially, anywhere near that age. It’s obviously pretty special. It’s pretty cool to see him hit b.p. every day and see a kid that can hit one in the lights and all that stuff. That don’t happen very often. What have you seen in his improvement over the last year? When he got to us last year, he was put together very well. There wasn’t a whole lot of adjustments made to his swing, besides to what he was thinking at the plate and trying to get used to pitchers challenging him with the fastball and not always throwing breaking balls to him. We haven’t really wavered from that. He got off to a slow start here, but I never really had a doubt that he was going to do what he did last year and then some. When you see somebody do what he did last year, you’re kind of, you know it’s in there and it’s just a matter of time before his mind and his body sync up and he takes off. What contributed to his slow start? I just think the huge expectations that the outside world, or himself, or anything else puts on a kid like that, or for that matter, most of these guys. They got here and they’re all young and they’re going through the same things. I think defensively he’s been playing real well for me. He’s 6-foot-5 at third. He moves well real and he’s agile. I just try getting him to get a little bit of movement before the ball crosses the plate so he can get that big frame moving. Basically, the big thing for him is to have a wide base so he can get down and field the ball. Guys of that stature, you’ve got to make sure they use their legs a lot in the field. He’s got good hands. He can handle third. He’s obviously got a lot of things to work on, but I’m pleased with the way he’s playing defense. He’s a very good instinctual baseball player. He runs the bases really well for a big man. When you see those kinds of things in a player, those are special traits that a lot of guys don’t have.